From celebrations during the Iron Age, through to make-do festivities in the Second World War, join us to discover more about the changing traditions of Christmas. You’ll discover the history of mince pies and carolling; advent and the indulgence of a Tudor Christmas Day feast; Victorian influences such as the sending of Christmas cards; and how war and rationing impacted on everything from decorations to Christmas dinner. There’s plenty for the whole family to enjoy. We will be adding to the programme below as we confirm activities and timings throughout the year! Get hands-on with some festive crafty fun. Treat yourself to a sausage/veggie roll, mince pie, wassail punch or mulled wine, served hot from the Victorian range. 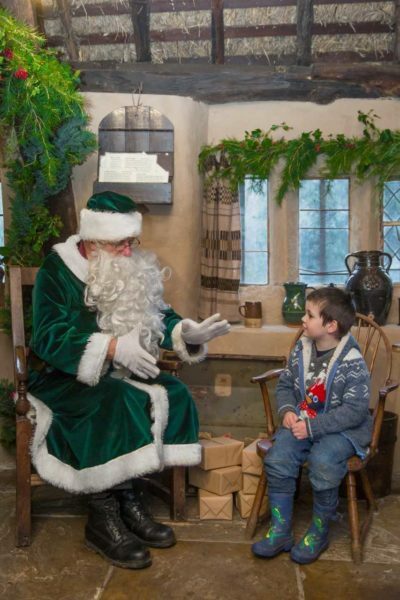 11am-12:30pm & 1:30pm-3pm: visit Father Christmas, dressed in his traditional green garb (charge applies, includes gift). 1:30pm / 3pm: enjoy a variety of traditional carols and festive songs, beautifully performed by local choir Harmonia. FREE ENTRY for Annual Pass holders and Under 16s. As per our Annual Pass terms & conditions, passes must be presented on arrival at the Museum, valid for use on the date your are visiting and pass holders will be asked to sign in.